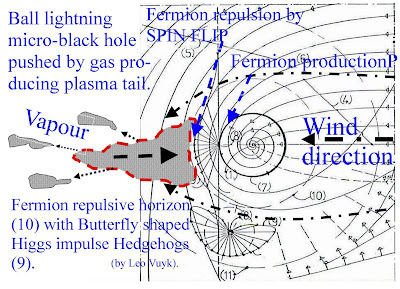 What is observed in this very-slow-motion video (below), is the baffling splitting and "evaporation" of micro black holes (the hotspots) as the origin of so called Stepped Leaders of lightning strokes. 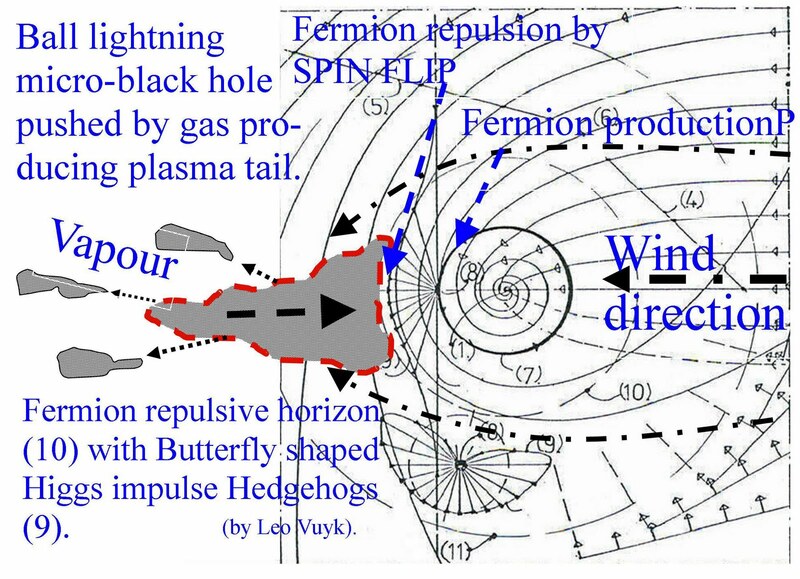 As a consequence we may assume that the multiple micro black hole splitting, is the start of the creation of a lightning channel through air, but also through the tetrahedral Higgs vacuum. Thus it is assumed that the structure of the tetrahedral Higgs vacuum is temporarily broken down to facilitate the passage of high speed electrons or even ions. 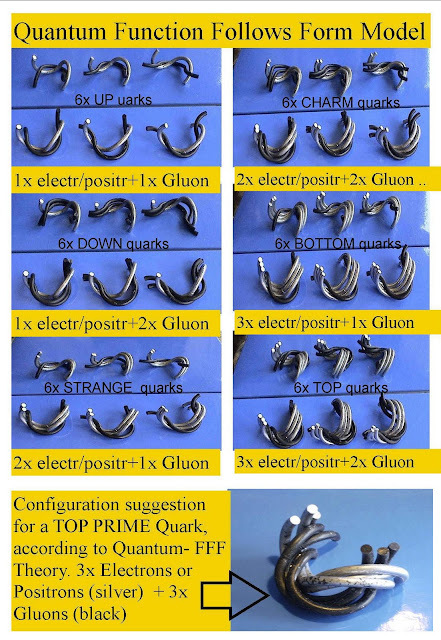 The vacuum breakdown of the Lightning channel is assumed to be the origin of the super conduction of high speed lightning charge without vacuum or air resistance. Last year, it was professor L.Dwyer who found x-ray/gamma-ray evidence inside "leaders" of lightning strokes. Dwyer took his pictures in July and August in collaboration with a team from the University of Florida at the International Centre for Lightning Research and Testing. He turned 25 of them into video clip that shows 2.5 millionths of a second in the life of one lightning strike. It is a painstaking look at an elusive subject". Conclusion: there is a firm reason to suggest that Ball Lightning is the remnant of one of the descending micro black holes of a lightning leader, before they are evaporated!! Secondly Ball Lightning /microComets are the remnants of a fireball produced by so called Sprites at high altitude (70-100km)! 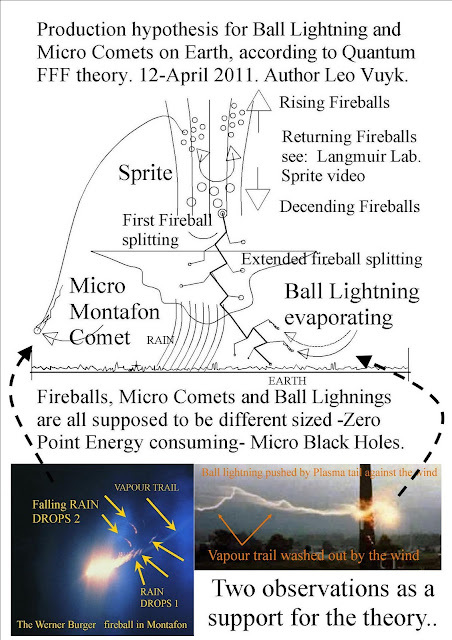 Figure above: Simplified representation of the relation between the creation of Fireballs inside Sprites or Lightning strokes, with the resulting effects on Ball lightning and Micro Comets as is found in Austria (Montafon area) by Werner Burger. Micro Comets (as in Montafon) seems to be far more frequent than expected and able to travel over long distaces in the stratosphere. Werner Burger reported: some raindrops fell, a Thunderstorm was far away. This fact is a strong support for the hypothesis that Sprites located at the top of heavy Thunderstorms produce Fireballs (micro black holes), which can travel over long distances and present themselves as micro Comets or Ball lightning, even far away from the Thunderstorm. Mysterious Ice Chunks, falling from the sky, seem to be the remnants of these Micro Comets/ Ball lightnings if we adopt the principles of my Quantum FFF theory, including the new black hole paradigm. (Below) Example of photonic particle knot formation in silicon discharge experiments. Also Sprites and Elves are supposed to be subjected to this Quantum Knotting ef fect, not by the silicon atomic structure but by the three or four interfering Photonic wavefronts, leading to nano black hole formation in sprites and elves and quick evaportion.!! 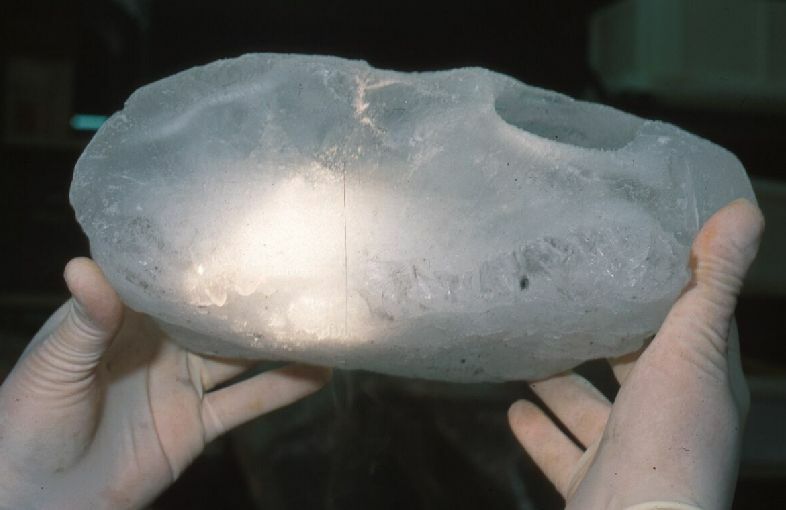 A possible remnant of a micro Comet: a large chunk of ice! 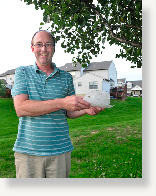 Bill Snyder of Neffsville (USA) holds a piece of ice that sheared through a tree in his yard under cloudless skies on Sunday. 12-10-2010.
or search for "Ice Meteor"
In my humble view, most of these ice chuncks could be the nuclear remnants of Micro Comets broken into pieces. However one of them seems to be in tact as the nucleus of a very small micro Comet, with a clear hole in the centre, showing the evaporated micro black hole location. However these Comets evaporate before crashing on earth. 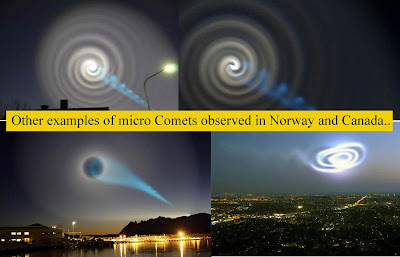 Thus it seems to be fair to assume that most ice chunks, falling from the sky, are the remnants of icy micro Comet nuclei, initially formed as fireballs in so called Sprites high above Thunderstorms. IF the next video is not a fake, then we see here a nice example of formidable sprite based micro Comet. also coined Russian Test rocket failure!! 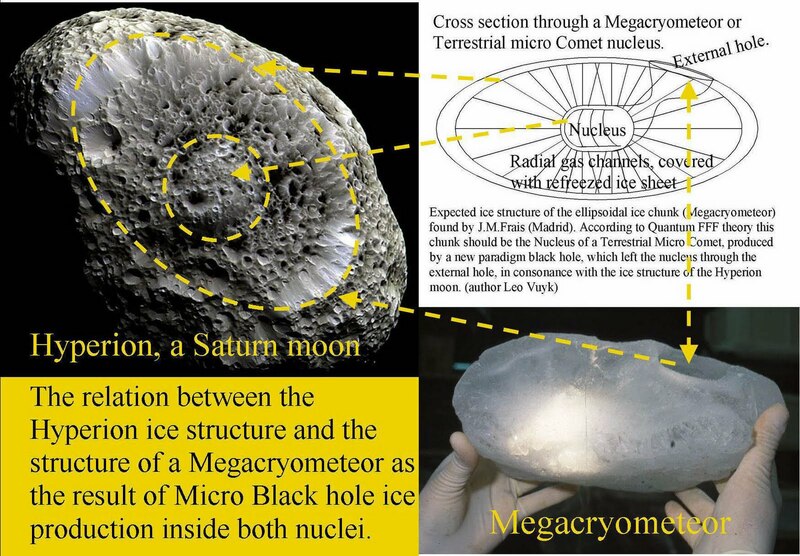 The possible relation between Hyperion and a Megacryometeor, as the nuclei of Comets large and small. 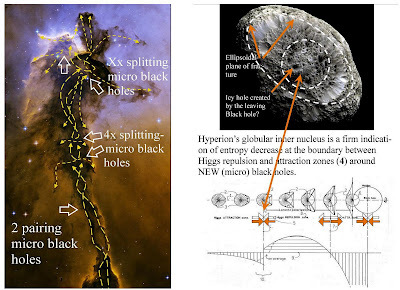 According to Quantum FFF theory, Hyperion is a former Cometary nucleus, left alone by its new paradigm black hole nucleus. Terrestrial micro Comets are also supposed to be originated by micro black hole nuclei and after the disappearance of the micro black hole, a Megacryometeor is left behind and will fall from the sky as a chunk of ice. Micro Comets even seem to be produced at the solar surface, just like Sprite Fireballs and (partly) fall back again. Fermilab Tevatron Bump explained according to Quantum FFF theory. Here I present a proposal for the origin of the recent Fermilab’s Tevatron bump at 144 GeV-145 GeV. which untill now is explained to be a kind of Z or W particle variance. 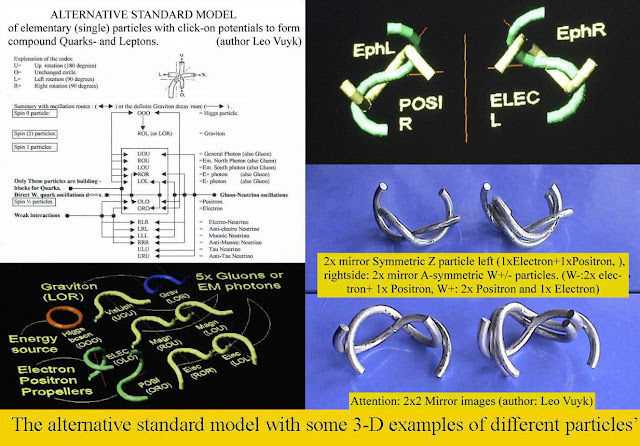 See the image of my proposal for Z and W particle 3D configuration below, as it is assumed to be a combination of TWO 3D-spagetti propeller shapes of the Electron and Positron, according to Quantum FFF theory. 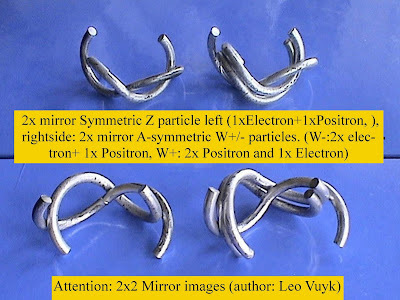 Multiple propellers inside one Fermion together wit multiple connected Gluons, make it possible to construct all known particles. 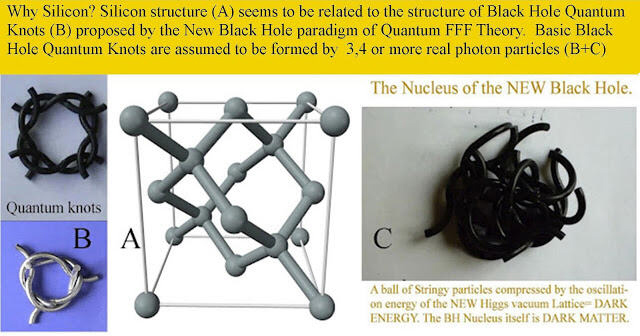 So my Quantum FFF Theory could be named: Multiple Propeller String Theory or 3D-propeller String Theory. At the right side of the 3D image the W+ and W- particles are shown as each others mirror particles. W- should have TWO Electron click-on propellers and ONE Positron propeller. In contrast: W+ is equipped with TWO Positron propellers and ONE Electron propeller. You will observe that there is room enough for extra “click-on” Electrons or Positrons making the W particle extra “massive” to reach 145 GeV?. Liquid water in deepfreeze ice nucleus of Comet Wild 2. New evidence for the need of a new black hole paradigm as the energy source and creator of the ice nucleus of Comets and all other gas and dust in space. 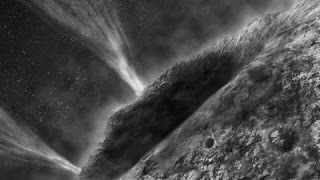 For the first time, scientists have found convincing evidence for the presence of liquid water in a comet, shattering the current paradigm that comets never get warm enough to melt the ice that makes up the bulk of their material. "Current thinking suggests that it is impossible to form liquid water inside of a comet," said Dante Lauretta, an associate professor of cosmochemistry and planet formation at the UA's Lunar and Planetary Laboratory. FUNCTION FOLLOWS FORM in Quantum FFF THEORY. The FORM and MICROSTRUCTURE of elementary particles, is supposed to be the origin of FUNCTIONAL differences between Higgs- Graviton- Photon- and Fermion particles. As a consequence, a NEW splitting, accelerating and pairing MASSLESS BLACK HOLE, able to convert vacuum energy (ZPE) into real energy by entropy decrease, seems to be able to explain quick Galaxy- and Star formation, down to Sunspots, Comets, Ball Lightning and even a cyclic Multiverse. 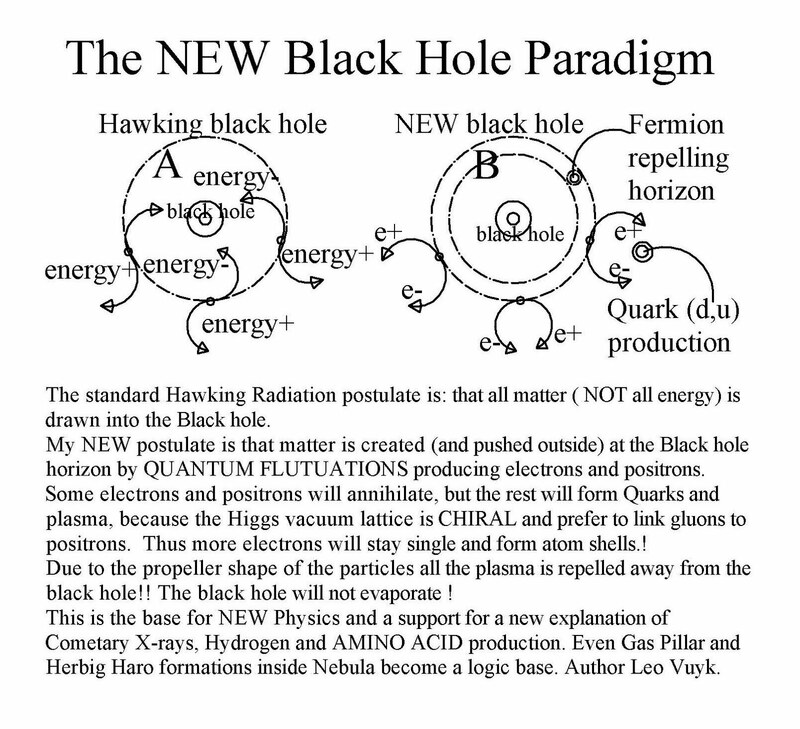 Keywords: Higgs Dark Matter Black Hole, Higgs Dark Matter Particle, Higgs Dark Energy Particle, Zero Point Energy Comet. Quantum FFF theory states, that the vacuum is seeded with fast oscillating massless Higgs particles, oscillating along a complex chiral tetrahedral vacuum lattice with the Planck scale. The vacuum lattice has the ability to transfer Photon/Gluon/Neutrino and Graviton FORM information in bunches of Higgs oscillations with the local speed of light. The massless Higgs particles are supposed to be the driving force of all propeller shaped Fermions by scattering processes and give Fermions a double axed spin. 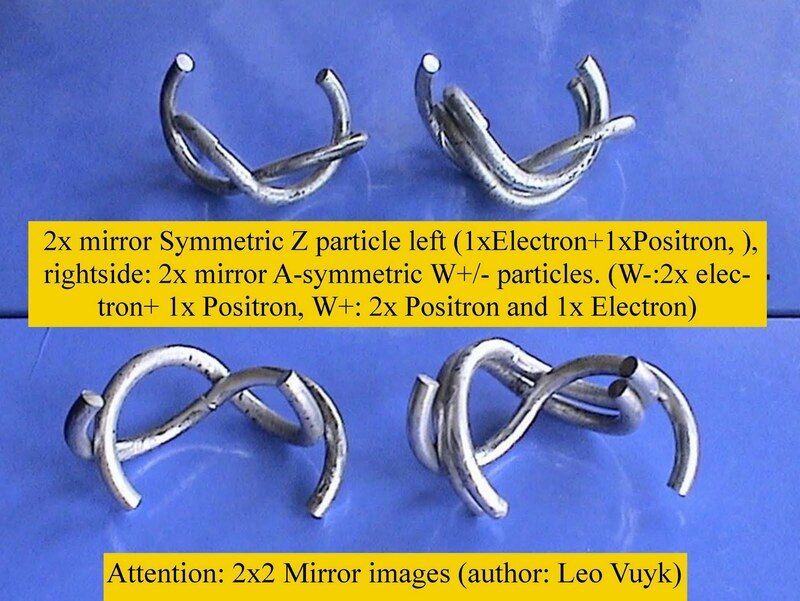 The second axis of Fermion spin is supposed to be aligned with the Magnetic poles of the Fermion radiating two different kinds of magnetic monopole photons. The Graviton and Electric photon radiation is supposed to radiate with an equatorial distribution to the second spin axis. As a FIRST consequence there are no attraction forces on Fermions in the universe. 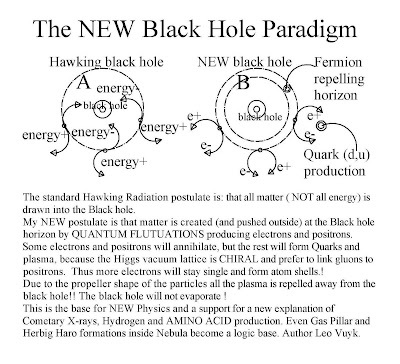 As a SECOND consequence, Black holes suffer only from Higgs impulses and NO gravitons can escape the black hole. 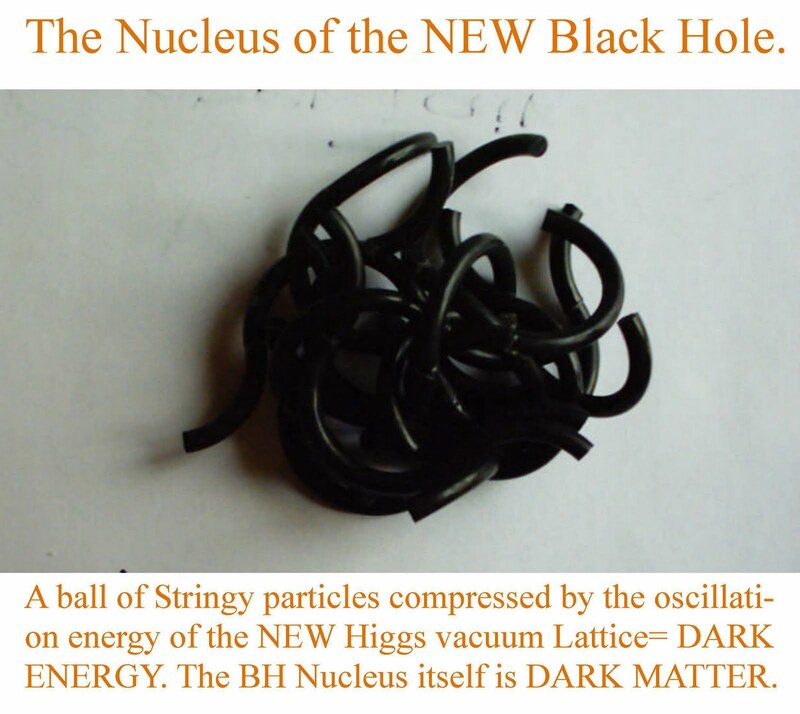 The Black hole nucleus is supposed to be a super dense knot of Higgs particles, which act as Dark Matter particles inside a Dark Matter Black Hole. Only the statistical sum of the different kinds of Higgs-Photon vacuum impulses from all directions on Fermions are responsible for all energetic phenomena in the universe. As a THIRD consequence, All Fermion and Photon particles are supposed to be entangled for all wavefunction collapses by a new form of entanglement between at least TWO copy Multiverses. This Multiversal entanglement can be called Consciousness. Intelligent systems seems have a retardation system for the entanglement process of wavefunction collapse, which could be able to produce human responsibility and human moral. See: Postscipt under the Benjamin Libet experiment and Free Will.